Last October, I participated as speaker at the SANS DFIR Summit in Prague. It was a great meeting and I am very happy to have been able to participate. My speech was focused on DPAPI, the Windows Data Protection API, and how it could be used during a post-mortem digital investigation to access protected information: overcoming system's security it's sometimes necessary to access data otherwise not available. I like to call this "process" ODI, Offensive Digital Investigations. The last work is an awesome research made by Elie Bursztein and Jean-Michel Picod, who first published DPAPI intimate details. They even provided dpapick, an Open Source Python tool able to offline decrypt DPAPI blobs (aka the encrypted information) up to Windows Vista. Their work is a milestone to deeply understand this technology, and it was my entrance and reference when I started to dig inside DPAPI. For this reason I decided to try improving dpapick by adding Windows7 and Windows 8.1 support: after some nights inside WinDbg, I was able to decrypt blobs coming from these systems, just in time for the SANS conference. Then Jean-Michel took my patch, refactored the code and added some other cool features, releasing the dpapick version 0.3 in the middle of October: check the new features added in his blog post here. Just a note on Windows 8.1: DPAPI decryption is supported only for local accounts, not for online accounts. As you can read here, "[DPAPI is] used to encrypt and decrypt static data on a single computer. Cloud computing, however, often requires that content encrypted on one computer be decrypted on another": so Microsoft introduced DPAPI-NG to allow sharing of secrets/whatever on different computers, after proper authentication and authorization. DPAPI-NG is used when working with online user accounts, and it's not currently supported by dpapick. Ideally this post should have been published few days after the meeting, anyway it's here: some examples on how you can use dpapick to access data protected by DPAPI tech. First, you must download the dpapick version 0.3 from bitbucket (the zip file or the mercurial clone) or (cool news) install from pypi! The pro with the installation option is that it will take care of dependencies, otherwise you must set the correct PYTHONPATH and provide the 3rd part packages: dpapick itself is pure Python, so no issues with the OS you're using. In the post examples, I used both Linux and Windows. Second, you should have a Windows OS mounted somewhere: I'll use the vmdk virtual disk files coming from the Windows 8.1 and Windows 7 VmWare guests I used during the reverse engineering phase. Alternatively you should extract the needed files from your target Windows and place them wherever you prefer. One of the cool features added is the capability to decrypt Windows7-8.1 LSA secrets (credits to mimikatz too): this feature is needed to grab the system key (DPAPI_SYSTEM) used by Windows to dpapi-protect some info. Moreover it could expose some other interesting info. Let's use the script lsasecrets in dpapick folder "examples": in the first instance use '--hex' to avoid unpleasant string conversion errors, it's not all a string there (note that command and parameters used are splitted on more lines to ease reading). The DPAPI_SYSTEM value it's the data needed to unlock system masterkeys and to decrypt system blobs. 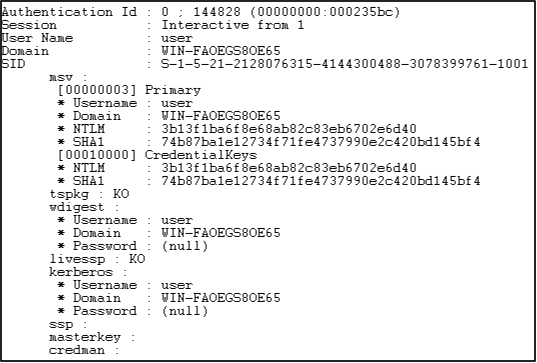 Then we were able to get NL$KM value, used by Windows to encrypt domain cached credentials, and... what? DefaultPassword (aka user auto-logon password)? I can't figure out why it's there, perhaps VmWare easy-install? Anyway, let's get only those values. Ok, 'fuffa' is the current user password and 'ROOT#123' the old password. That's a windfall, since getting the user password in this way it's too easy... and so we'll able to unlock DPAPI for the user. Later we'll see another way to unlock user DPAPI. Let's see an example of system's secret, wifi credentials. As you should know, when you connect to a wifi network with the right password, this data will be saved inside your os (together with other info) for later reuse: a sort of SSO. This storage is not per-user, but system wide and the passwords are protected with DPAPI: you need the DPAPI_SYSTEM "secret" to decrypt them. I just realized the current dpapick has not scripts to handle this task, so I wrote the following one which will provide wifi credentials (just wifi name and password): I called it wiffy, to train my talent in providing cool names... As is as usual, just quick&dirty coding. Let's execute wiffy (it sounds like a name for dogs... but it's inside the urban dictionary... no copyright then...) against my real windows8.1 installation, so results will be offuscated (you too curious). As you can see in the Primary column, the SHA1 hash is always there with only one exception, the domain protected users. That SHA1 is the SHA1(UTF16LE(user_password)), which is exactly the only secret part of the pre-key needed to unlock masterkeys (refer to the slides)! So despite the fact the Microsoft hardened Windows by removing default user password presence in some SSPs (Security Support Providers) or despite the user configuration (see this great post from Mike Pilkington) the SHA1 will allow DPAPI decryption even if the user password is not known. To the best of my knowledge you can't configure/remove (aka harden) the primary SSP (msv1_0). Result: grab that hash and enjoy with dpapick, which handles it wonderfully. As expected, no cleartext password but... the SHA1 is there! Since I know my password (do you remember the previous 'fuffa'? ), that SHA1 is exaclty the SHA1(UTF16LE('fuffa'))... Rememeber, with virtualization you must know the user password to access DPAPI protected data (you can't reset the user's password): here, with dpapick, you only need the "always present" SHA1. Since I'm talking about ODI, I'd like to show how dpapick usage could help during a digital forensics investigation. Recalling the slides, if you face an "unbreakable" (something to say here...) turned off iPhone, with no passcode provided... you will not be able to access its data. Suppose you have the suspect's laptop (but no Apple LockDown certificates) too, and iCloud installed... or suppose you have only a laptop with iCloud installed... This scenario could be called "Access to otherwise inaccessible data". The iCloud Windows application allows the users to backup their idata on the (i)cloud (too many 'i'...), a well-known feature with some well-known issues too... but it's another story. During the installation, iCloud asks for the user credentials once and then it starts doing its job every time the computer is powered on. In other terms, single sign on in action (and autorun, btw). The iCloud credentials are kept inside the com.Apple.AOSKit.plist file, in "\Users\<username>\AppData\Roaming\Apple Computer\Preferences\". This file contains a data section which is a large DPAPI blob: to be short, it's enough to execute the icloud.py script inside dpapick/examples folder to get the job done. For any detail, refer to slides and to the icloud.py code. Binary PLIST file for account iFooFooFoo@icloud.com decrypted! Decrypted plist written in file "../aoskit.plist.plist"
(ERRATA: when using the --hash parameter instead of --password, as I do, a quick fix is needed in icloud.py code... add at line 65 "options.h.decode('hex')"... sorry, I forgot it, and it will be fixed). What you get is a new decrypted plist file, which contains a lot of useful and interesting info (mailToken, cloudKitToken, etc.). The iCloud token is the pair [dsPrsID, mmeToken]: with this token you can access the user's iDevices iBackups ('i' again...) stored online. For this last task I use Elcomsoft Phone Password Breaker (see here), simply because it's the only tool providing such a cool feature in the way I like. Anyway, you could also try with another iCloud by re-encrypting the decrypted token with your current Windows user DPAPI (not providing code, but it's simple). Dropbox obfuscated Python code it's an hard reverse engineering quest. 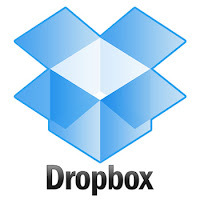 There are at least three notable works on it, but here I want to cite the awesome one made by Nicolas Ruff and Florian Ledoux, "A critical analysis of Dropbox software security", more than two years ago! They even provide the useuful code to obtain the encrypted dbx decryption key, which is protected by DPAPI. Being brief, check their work on https://github.com/newsoft: the dpapick dropbox script is based on their findings. So, to get that decryption key, just run dpapick dropbox script, as shown in the next example (note: the same errata as icloud applies if using the '--hash' parameter), where I used dpapick from a Windows machine. Then? As reported in my slides, you need EE Sqlite (Encryption Extension, see here), which is not publicly available. Newsoft provided a 3.7.0 sqlite3 source code with EE, so you can grab it from their github space and use it with the extracted password. If you are curious as I suppose, you can even try to find out how many DPAPI blobs you have inside your Windows. To the best of my knowledge, actually there is only one crypto provider used, whose GUID is "df9d8cd0-1501-11d1-8c7a-0c04fc297eb": so, with a simple hex-searching you will be able to spot them. Then, with a next-to-come dpapick script, it will be easy to verify the bytes found and, in case, decrypt them. 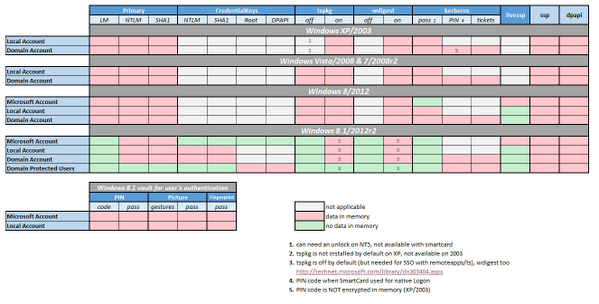 There are many secrets protected with DPAPI, for example Windows Vaults (lazy wip here). So feel free to write to me and/or to Jean-Michel providing some info regarding the usage of CryptProtectData in your target app, your scripts or whatever could help improving dpapick. As you read, dpapick needs some tunings and addings, but it's an invaluable tool when you need to access protected data to go on with the investigation. So, Happy DPAPI(ck)! If you reached this last part of the post (without directly scrolling here, cheater! ), then you deserve a bonus. When exploring LSA secrets, I pointed out the presence of the DefaultPassword old value, which surprised me. I did some more tests on 6 different installations of Windows 7, 3 Windows 8.1 and 1 Windows Vista. All but Vista contained that DefaultPassword old value set, without having the auto-logon feature enabled: this password seems to be the first one inserted during the Windows installation and, by changing the current one, it does not change (not tested the auto-logon enabling and disabling). The conclusion? Hardly definitive due to reduced dataset (please share your findings), but it could be said that starting from Windows 7, Windows keeps in the old DefaultPassword value your first password (assumed auto-logon disabled). The risk? It depends on you. The opportunity? It depends on them. Anyway, from today, I'll always check this value.